In 2009, a nine year-old Brazilian girl became pregnant with twins after being raped by her stepfather. With advice from doctors, her mother opted for her to have an abortion. After pleading with Brazil, which outlaws abortions except when the mother’s life is in danger or when she has been raped, her daughter was granted one. Then things got really ugly. When the Archbishop of the city of Recife heard the news he invoked Canon law and excommunicated the mother and daughter and the members of the medical team who performed the abortion; the stepfather, meanwhile, remained a loyal and accepted member of the church. Was it right for the girl to have an abortion? Was the Archbishop correct to condemn her, the mother, and the medical team? And what of Brazil’s stance on the matter? We’ve heard these debates fleshed out countless times, and almost always to no avail. Far more interesting (and quantifiable) are the psychological forces that fuel these conversations. While many like to believe that they have a special access to the truth, the reality is that we all see the world not as it is, but as we want it to be: Republicans watch Fox while Democrats watch MSNBC; creationists see fossils as evidence of God, evolutionary biologists see fossils as evidence of evolution; a mother sees abortion as the best thing for her daughter, and the church sees it as unholy and sinful. You get the point – our beliefs dictate what we see and how we see. The question is: why do humans remain so steadfast to their beliefs, sometimes even in the face of overwhelming opposing evidence? The answer rests in a few psychological tendencies that when mixed together form a potent recipe for ignorance. 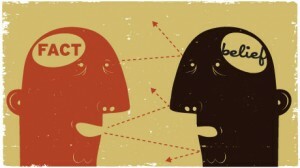 The first is confirmation bias, which I wrote about last month over at Scientificamerican.com. Confirmation bias is exactly what it sounds like – the propensity for people to look for what confirms their beliefs and ignore what contradicts their beliefs while not being concerned for the truth. Then there’s cognitive dissonance, which describes a “state of tension that occurs whenever a person holds two cognitions that are psychologically inconsistent.” Leon Festinger introduced it in 1957 after he infiltrated and studied a UFO cult convinced the world would end at midnight on December 21st, 1954. In his book When Prophecy Fails, Festinger recounts how after midnight came and went, cult members began to look for reasons for why the end of the world had not come. Eventually the leader of the cult, Marian Keech, explained to her members that she received a message from automatic writing, which told her that the God of Earth decided to spare the planet from destruction. Relieved, the cult members continued to spread their doomsday ideology to non-believers. Although Festiner’s example is extreme, all of us do this everyday. Take unhealthy food; we all know that pizza is bad for us, but we still eat it. And after finishing a few slices we say “it was worth it,” or “I’ll run it off tomorrow.” Or take smokers; they know that smoking kills but continue to smoke. And after unsuccessfully quitting, they justify their failures by claiming that, “smoking isn’t that bad” or that “it is worth the risk.” Whether it’s UFO’s, food, or smoking we all hold inconsistent beliefs and almost always side with what is most comfortable instead of what is true. Finally, there’s motivated reasoning, which describes our tendency to accept what we want to believe with much more ease and much less analysis than what we don’t want to believe. In one study done by Ziva Kunda, participants were brought into a room and told that they’ll be playing a game. Before the game started, they were instructed to watch someone else play the game who will either compete with them or against them. However, Kunda rigged the study; the participants actually watched a confederate, who played the game perfectly answering every question correct. Kunda found that the participants who were lined up to play against the confederate were dismissive and tended to attribute his accuracy to luck whereas the participants who were lined up to play with the confederate were praiseworthy of his “skills.” Both groups saw the same performance yet came to exact opposite conclusions. Clearly, we scrutinize much less when things go our way. People don’t change their minds – just the opposite in fact. Brains are designed to filter the world so we don’t have to question it. While this helps us survive, it’s a subjective trap; by only seeing the world as we want to, our minds narrow and it becomes difficult to understand opposing opinions. This helps explain the conflict in Recife. When we only look for what confirms our beliefs (confirmation bias), only side with what is most comfortable (cognitive dissonance) and don’t scrutinize contrary ideas (motivated reasoning) we impede social, economic, and academic progress. I am not sympathetic to the Archbishop by any degree, but when we consider how effortless it is for people to latch onto ideas it is easier to understand why he took such a harsh and unchanging stance. ← Is It Possible to Not Judge A Book by Its Cover? We’re almost _doomed_ to religious, myopic thinking — or, one could say, we’re _blessed_ with a tendency to be faithful, steadfast, fanatical believers. Very aptly n rightly said , we construct our worlds acc to our convictions. Is the author of this article free from this treacherous trio? If so, is he somehow less human than the rest of us? If not, how can we trust his analysis and conclusions? @Ken Wieske. I’m not free from this treacherous trio. Everyone has these biases – some used for good some used for bad. So I’ve left it up to you, the reader, too make up your mind. That is such a bs reply… how does that make you feel? Your whole point is devoid of critical thinking that permits sane people to determine right from wrong. Are you referring to the author of the article? Your comment seems to indicate you don’t really understand what critical thinking is. This article is explaining why many people have trouble with critical thinking. Critical thinking is not about teaching you what is right from wrong, it is learning how to listen to and consider those views that you emotionally disagree with so that you yourself can try and work out what you think may be right or wrong. There are some people are controlled and dictated by the facts. Most people manipulate the facts to fit what they want to believe. Look for these key phrases, “I choose not to believe that” or “I don’t want to believe that” or something along those lines. This means that even though the evidence is contrary to your belief, you will hold onto that belief anyway. Like a man who refuses to acknowledge his spouse is cheating, even though all the signs are there and he caught her with another man. Or the woman who stays with a man that beats her half to death on a regular basis because “he loves her”. Its a serious form of denial. Great post. Reminds me of the motto of one of my favorite teachers, Dennis Prager; first tell the truth, then give your opinion. But if you’re a member of the GOP, what’s the point since your truth will be a lie? My teacher, the late Bob Abelson of Yale’s psychology department, used to refer to people’s “delusional systems” when we might have conventionally referred to their “belief systems”. Here’s a grammar error that I first thought was irony/pun: “Weather it’s UFO’s…”. I thought the author was using this phrase as part of a belief in UFO’s vs. weather balloons until I read the rest. I guess it wasn’t that good of a joke. ‘Weather vs whether’. That’s not a grammar mistake, it is a spelling mistake. If you are going to criticise something so petty, then at least get it right! It is a grammar mistake. “Weathr” or “Wether” are spelling mistakes. That’s why I’ve read your post, to confirm my bias about the non-existence of free will. Human beings like to live in an orderly world, even if we have to create that order in our own minds. Any belief system, how ever strange or delusional it may seem to another, is still a belief system. If we could accept other people’s belief systems more open-mindedly, it might make for less strife in the world. But you just rule out the possibility of a smoker really enjoy smokes? That it really worth the risk? So we have the absolut objetivity of worth of life? All contrary is expression of cognitive dissonance? You can like to smoke and say “Yeah, I know its bad for me, but I like it anyway.” You would be making an informed decision to do what you want, and that is respectable. But to say “Its not that bad.” is to deny the factual evidence of health effects linked to smoking, and that would be an example of all that he has mentioned in this article. Can I simply say what a relief to uncover somebody who truly knows what they are discussing over the internet. You certainly know how to bring an issue to light and make it important. A lot more people must look at this and understand this side of your story. I can’t believe you’re not more popular because you surely possess the gift. Have there been any studies on how strong these biases are in people who have already questioned everything they think they know, such as fundamentalist Christians who become atheists? It seems to me that people who have already called into question their basic belief structure might be less likely to cling to biases later once they are shown evidence to the contrary. I’ve observed, in religious believers, that these three factors tend to reinforce denialism. Overall people are seeking to protect their worldviews from doubt and ultimately their egos or more specifically their desire to justify their beliefs as being correct. In Buddhist meditation we are instructed to be with what is, without labeling or judging. We also strive to not apply labels to ourselves in daily life thereby eliminating the need to protect beliefs attached to those labels. Delusions are the result our attempts to hold on to fixed views in an ever changing environment. I’m currently a writer. In a moment I will be a mouse-clicker after that I will be a spreadsheet author again. This blog is very informative. Thank you! I read this in Jan 2017. We need answers to our this urgently. I’m guessing the answer lies in something like the practice of mindfulness? snowdeal.org - the cognitive basis for irrationality. Election 2016: Have We All Gone Nut's? Fake News and Alternative Facts are Contingent on your Perspective: A Discussion of Motivated Reasoning - How Do You Think?